Cucumbers and apple cider vinegar are just the thing for a touch of gout. Photo: David Reist. Bryan Martin writes for Region Media about food and wine each month. He is the winery manager at Clonakilla and runs the Ravensworth label. As a 60’s child who enthusiastically chanted about hoping to die before I got old, we’re all staring down the barrel of actually being sixty soon (ish). And it turns out that we’re quite content not to die just yet, but to live comfortably, join a park run, become, if we so choose, an aqualete and walk into our doctor’s waiting room with confidence. As he’s talking, I waver in and out as my mind wanders back to every injury I have dealt myself in a life full of doing silly things. Each badge from a life lived far from both a desk and reasonable coordination, is potentially the source of searing discomfort if I drink a Saison or two after work. I’m starting to understand that desperate moment in time when you’re on the desert island or floating in the life raft, maybe clinging to the side of a mountain. Smoke is billowing from the aircraft ruins, the food long gone – that moment when you realise you’ve drawn the short straw. He holds his serious doctor face, enjoying, no doubt, his moment, and breaks into a big grin. “Just messing with ya mate, take these pills and you can eat whatever ya want”. Oh, funny guy. If I understand correctly, this is a genetic arthritic condition. It is not life-threatening. There will be no slow, slightly awkward march, or special mention at the finishing line, just general discomfort if you consume something remotely fun. It’s a very ‘Canberra’ condition to have. 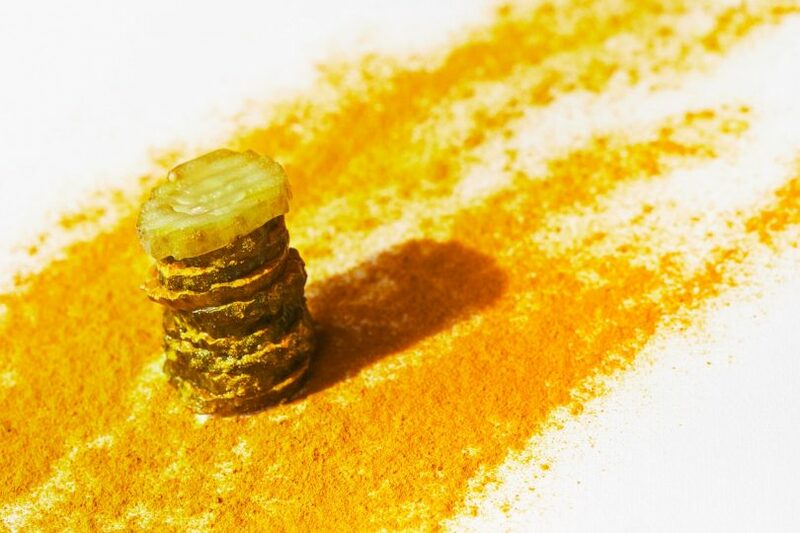 Pickles are also fun, and a good way of delivering both apple cider vinegar and turmeric. I’d suggest they are a great accompaniment to a burger and a beer. I would critically review my first beer (below, a salty and sour Rodenbach), but then I’d potentially regret it sometime in the future. Cut the cucumbers in quarters lengthways. Sprinkle with salt and leave for an hour, mix around to make sure they release their fluids. Bring the rest, except the dill, to the boil in a suitable pot, stirring to dissolve sugar. Don’t rinse the cukes, just drain liquid, brush them off and pack into sterilised pickling jars. Pour over the hot liquor and add dill. Cover and let them cool completely before sealing & chilling. Personally, I’ve taken a shine to sour beers, a little late it turns out. At first taste they were horrid, like you were trying to drink that bit of liquid in the bottom of the recycling bin. However, once you get a taste for them, normal beers seem clumsy, just a mixture of hops and malt. If you’re interested, Rodenbach Red 375ml Tinnies is an entry-level, gentle brew to ease you into the strange world of sour beer before you attack some of Topher’s Wildflower range from Marrickville. It’s one of the less scary Flemish sour beers. Think of it like you are in a Dahl novel. You are running through a forest in the dark of night, lots of wild things are chasing you, you get glimpses of them through the trees, those mean, ugly leezle pons. But eventually, it turns out to be a Panda that leaps out and catches you. Sure it’ll still kill you, but Pandas are kinda cute so it’s all a little ironic. Original Article published by Bryan Martin on the RiotACT. This entry was posted in Food & Drink and tagged Apple cider pickles, Bryan Martin, Gout. Bookmark the permalink.